Many people are familiar with the Fourth Amendment and Fifth Amendment, which uphold our rights to remain silent when confronted by law enforcement. These Amendments recognize our right to remain silent to avoid ending up inadvertently saying something that can later be used against us by law enforcement. If you are in custody, you should refuse to answer any questions and instead inform law enforcement that you will remain silent until your attorney is present. If you are charged with a felony, it is critical to attend all parts of the legal process, including the arraignment, time of plea, preliminary hearing, and sentencing. An experienced criminal defense attorney can help you create a calendar of the important dates involved with your case. If you fail to appear in court for any part of the legal process, you can end up facing more serious penalties than just those associated with the felony. You should only discuss details about your felony charge with your attorney. 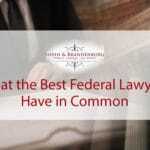 Conversations that you have with your lawyer about your case are protected by confidentiality laws, but conversations with your family and friends are not. Any details about the offense that you disclose to people can potentially be used against you. By limiting whom you discuss matters with, you will avoid making a mistake that might weaken your defense strategy. It is important that your criminal defense attorney understands the most accurate details about your case so that you can have the strongest defense possible. If you fail to give your attorney all the information, there is a risk that you can end up facing much more serious charges. While many people feel uncomfortable sharing details about an offense with a lawyer, it is important to remember that this information will be kept confidential and that your attorney is on your side. Being charged with a felony is a very serious event that can have a substantial impact on the rest of your life. If you or a loved one is charged with a felony, you should not hesitate to obtain the experienced of a skilled criminal defense lawyer. 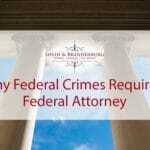 At the Federal Criminal Law Center, we have successfully helped many clients respond to felony charges. Contact us today to schedule a free consultation, during which time we will review your various options to respond to charges. This entry was posted in Criminal Defense, Felonies and tagged criminal defense attorneys, Felony Cases, Felony Charge. Bookmark the permalink.